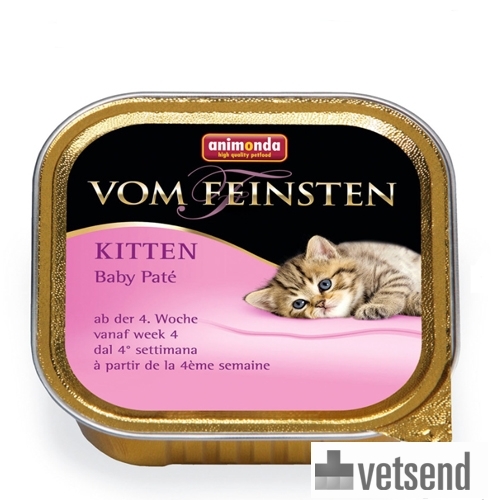 Animonda Vom Feinsten Baby Pate is suitable for kittens from 4 weeks old. It can be used as a transition food from the mother's milk to solid foods. Mother cats nurse their kittens for approximately 4 weeks. After 4 weeks, kittens can move onto more solid foods. Animonda baby pate is very suitable for this transition. This fine, creamy food helps the kittens go from milk to solid food. Animonda Vom Feinsten Baby Pate is suitable for kittens from 4 weeks old. This product is made from pure meat and natural taurine. This pate does not contain colourings or preservatives. Meat and animal derivatives (25% beef, 6% chicken), minerals. Have you used Animonda Vom Feinsten Baby before? Let us know what you think about this product.